Ling Xia, MD, FCAP is a fellowship-trained and board-certified dermatopathologist and anatomic and clinical pathologist with 15 years of practice experience. He earned his medical degree from Shanghai Medical University in Shanghai, China. He completed a pathology residency and pathology surgical fellowship in 2003 at Rhode Island Hospital, Brown University in Providence, Rhode Island. 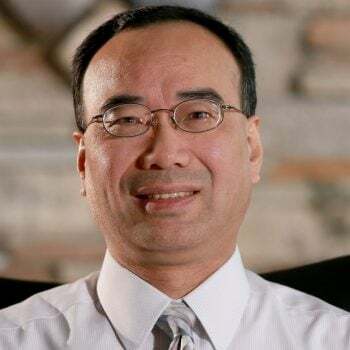 In addition, Dr. Xia finished his dermatopathology fellowship in 2004 through Cornell University Medical College and at Presbyterian Hospital and Sloan-Kettering Cancer Center in New York City, New York. He has been practicing with Forefront Dermatology since 2009 and takes a special interest in diagnosing inflammatory skin diseases and benign and malignant skin tumors. Outside of work Dr. Xia enjoys traveling and sampling all different types of cuisine. Lund J, Xia L, Kerr S, Stratman E, Patten S. “The Utility of a Touch Preparation in the Diagnosis of Fluctuant Subcutaneous Fat Necrosis of the Newborn”, 2009, accepted by Pediatric Dermatology. Poonawalla T, Xia L, Patten S, Stratman E, “Clouston Syndrome and Eccrine Syringofibroadenomas”, The American Journal of Dermatopathology: Volume 31(2), April 2009, pp 157-161..
Chandrupatla CV, Xia L, Stratman EJ. “Sjogren’s syndrome and granulomatous panniculitis”, 2008, Archives of Dermatology 144(6), 815-816. Reck, SJ, Xia L, Dehner LP, Reising CA, “Glandular Congenital Lymphadenoma”, 2007, Pediatric Dermatology 24(5), 547-550. DeLellis RA, Xia L, “Paraneoplastic endocrine syndromes: A review”, Endocrine Pathology, 2003; 14: 303-307, Review. Xia L, Wang L, Chung AS, Ivanov SS, Ling MY, Drago AM, Platt A, Gilmer TM, Fu XY, Chin YE. “Identification of both positive and negative domains within the epidermal growth factor receptor COOH-terminal region for signal transducer and activator of transcription (STAT) activation: 2002, J. Biol. Chem., 277, 30716~30723. Parker EM, Xia L. “Alternatively spliced variants of NPY5 gene determined the expression and tissue-specific distribution of the receptor” 1999, Journal of Neurochemistry, 73, 913-920. Saldou N, Obernolte R, Huber A, Baecker PA, Wilhelm R, Alvarez R, Li B, Xia L, Callan O, Su C, Jarnagi K, Shelton ER, “Comparison of recombinant human PDE4 isoforms: Interaction with substrate and inhibitors” 1998, Cell Signal, Vol. 10, No. 6, 427-440. Parker EM, Babij CK, Balasubramaniam A, Burrier RE, Guzzi M, Hamud F, Mukhopadhyay G, Rudinski MS, Tao Z, Tice M, Xia L, Mullins DE, Salisbury BG. “GR23118 (1229U91) and other analogues of the C-terminus of neuropeptide Y are potent neuropeptide Y Y1 receptor antagonists and neuropeptide Y Y4 recptor agaonists: 1998, European Journal of Pharmacology, 349, 97-105. Xia L, Shen W, Ritacca F, Mitri A, Madlensky L, Berk T, Cohen Z, Gallinger S, Bapat B. “A Truncated hMSH2 transcript occurs as a common variant in the population : implications for genetic diagnosis: 1996, Cancer Research, 56, 2289-2292. Bapat B, Xia L, Madlensky L, Mitri A, Tonin P, Narod S, Gallinger S. “The genetic basis of Muir-Torre syndrome includes the hMLH1 locus” 1996, The American Journal of Human Genetics, 59:736-739. Li B, Xia L, Krantz Z, Yuan Z. “Site-directed mutagenesis of Cys324 and Cys331 in human cytosolic phospholipase A2: locus of action of thiol modification reagents leading to inactivation of cPLA2” 1996, Biochemistry, 35, 3156-3161. Mesmer, OT, Lu ZM, Xia L, Lo TCY. “Effects of 2-deoxy-D-glucose on the functional state of the rat myoblast GLUT 1 transporter: 1996, Biochemistry and Molecular Biology International, vol. 40, No. 2, pp. 217-233. Xia L, Kelly ASD, Bapat B, “Evidence for a novel exon in the coding region of the adenomatous polyposis coli (APC) gene” 1995, Genomics, 28, 589-591. Lu ZM, Xia L, Lo TCY. “Use of hexose transport mutants to examine the expression and properties of the rat myoblast GLUT 1 transporter process” 1995, Biochemical et Biophysica Acta, 1234 (2): 155-165. Xia L, Lu ZM, Lo TCY. “Transcripts fro the high and low affinity hexose transporter in rat myoblasts” 1993, J. Biol. Chem., 268, 23258-23266. Lin, XT, Xia L. “Clinical case studies: The diagnoses and management of secondary hyperthyroidism due to pituitary tumor” 1991, The Journal of Nuclear Medicine (Chinese), 11 (2) 126-127. Xia L, Lin XT. “Review: Secondary hyperthyroidism due to TSH hypersecretion: Clinical features of pituitary tumor and diagnostic study in nuclear medicine” 1987, Development of Medicine Abroad (Chinese), 4, 230-233.